I was told in discord that using a higher colored pick to mine will allow you to FIND MORE colored ore veins than if not using one. This seems false to me. All I notice is when I do find a vein, I don't fail to mine the ore as much as if using a regular pick. So I tried to look it up and could only find these discord messages, but no actual proof. If ore veins are randomized how could a colored pick change your chance to find something that was already randomly spawned? Anyone know for sure? Thoughts? I think by more colored ore they mean more chance to get colored ore from a colored vein instead of plain iron, not to find colored veins. There are no colored veins, a vein is just a vein and you have a chance to mine colored ore.. an exceptional pick axe increases that chance, and a colored axe increases that chance towards that color ore.. I'm not doing the math, but by the formulas below, you can see that your tool bonus impacts your chance to mine colored ores, all ores really, and your tool bonus is determined by the type of pick (colored) you use. 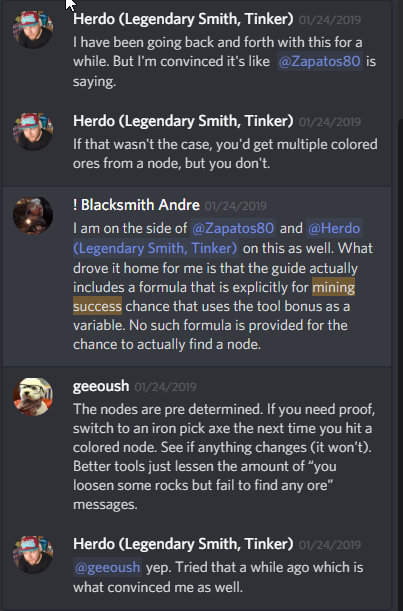 So unless I'm reading it wrong, I'd say a colored tool increases your chance to yield colored ore.
so you could just mine with a normal pick until you find colored ore and switch to avarite pick? Still confused, let me ask differently. If I equip an avarite pick will I find more colored ore, or will I just have a better chance of mining the colored ore i do find? Sorry man, but to me, this still isn't clear answer to what I'm asking. If what you are trying to say is what Kilgu wrote than I understand. If not I give up. If you are holding a colored pick axe, you may have a 99% chance to get regular ore, and a 1.0% chance to get colored ore.. These numbers are not accurate just used to represent the way it is.. And it's based on every single swing, not a particular spot you are swinging at, not a node, nothing like that.. Just a pure chance to get on every swing/activation. WHat theyre trying to say is, (and idk if this is how it works but this is what theyre saying) is that there is no such thing as a colored vein. every swing, depending on skill, rolls a chance to mine up colored ore, regardless of location. I'm not a miner but this makes me wonder how things like Valorite ore maps work? Those things sell for over 30K. Do they just spawn regular veins that have a higher than normal chance of Valorite? Edit: looking at wiki it seems like ore maps are a completely different system than veins. The ore maps are a completely different system, and are your best source for colored ore, as you are guaranteed the valorite.